If you have a current IELTS or TOEFL score (no older than 12 months) when you commence your English course, you can use the table above to see at which level you will need to commence your English studies. The minimum number of weeks of English study required to progress from one level to the next is 10 weeks. If you do not have a current IELTS or TOEFL result, you will need to sit a placement test which is conducted on the morning of the first day of the course (Orientation day). See the confirmation of enrolment form for the exact dates of Orientation Day. IESC insists that all new students, regardless of presentation of previous English proficiency certificates, sit a placement test and oral interview on their first day. You will be given a test at the end of each week of study. Your result in these tests will be used to determine your progressing to the next level. Weekly testing occurs in the four macro skills: reading, writing, speaking and listening. 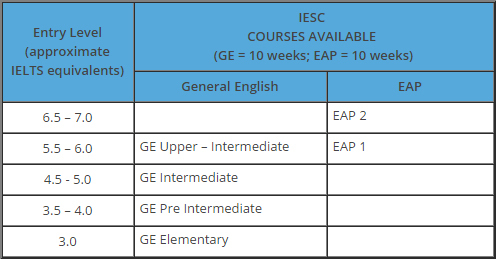 The English course is designed for 10 weeks’ duration. To progress to the next English level, students must complete a 10-week cycle and receive an average of 75% for all examinations. ELICOS programs have multiple start and end dates so that students can join any time and study for their chosen number of weeks. ELICOS courses do not always have a finite duration. All courses are language-focused, with a broad purpose of improving the students’ language proficiency. The majority of courses do not have minimum language proficiency entry requirements. Students are tested and placed in the appropriate language level on arrival. The courses do not lead to an award qualification, i.e. a higher education or AQF qualification. Such courses are called ‘non-award’ courses. IESC accepts international students with a variety of visa types, e.g. 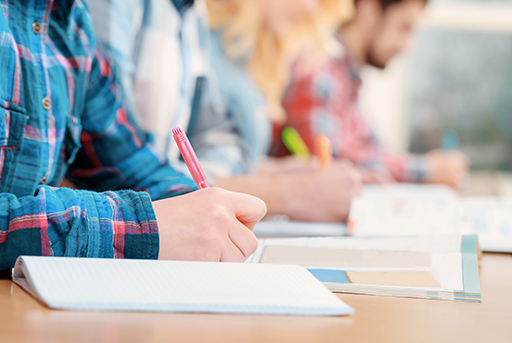 some students may have student visas, which are covered by the regulatory framework of ESOS and National Code 2007, while others may have non-student visas (e.g. tourist, working holiday, etc.) which are not covered by any existing regulation and therefore do not have welfare and consumer protection conditions. IESC ensures that even though reporting obligations do not apply to students in non-student visa holders, quality provisions are applied equally to all students regardless of visa type. For students at risk of not making satisfactory progress, IESC has in place, an “intervention strategy” to assist or advise students who are at risk of not satisfying course requirements. The intervention strategy may include steps including counselling, withdrawal for small group or one-to-one tuition, setting additional homework or language tasks, assistance with finding materials or resources on the internet, etc.